Designers craft amazing, intricate gowns for annual contest. July 24, 2017, 1:14 p.m. Here comes the bride, all dressed in ... double-ply? 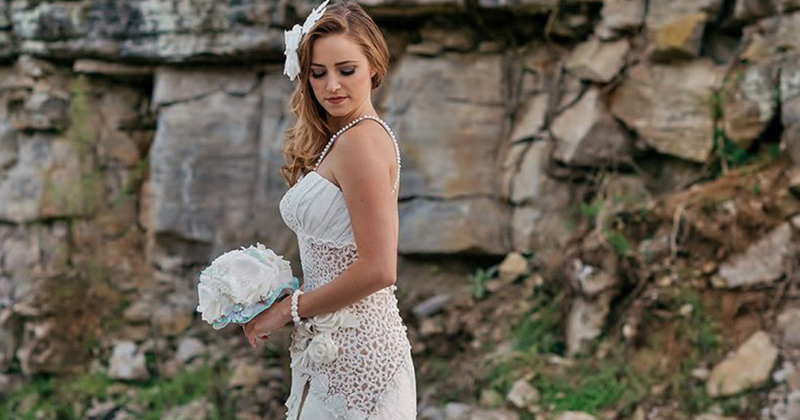 Not all wedding gowns are traditional, but few are made out of toilet paper. In a recent contest, people with some serious creative flair were asked to whip up bridal attire using basic bathroom TP. The rules are simple: Contestants obviously must use toilet paper. They can use any type of tape, glue, and/or needle and thread. The dress must be able to be worn and taken on and off. The model can't be sewn, taped or glued into the dress. And the results are ridiculously amazing. Instead of swathing their models like mummies, these toilet paper artists have crafted delicate masterpieces ranging from form-fitting numbers with intricate cutouts to retro designs with capes or tassels. There were more than 1,500 entries in this year's Toilet Paper Wedding Dress Contest. The 13-year-old competition is presented by Cheap Chic Weddings and Quilted Northern (of course). It took Kari Culetto,Las Vegas actress and mother of two, three months to craft her winning entry, which she calls "Quilted Enchantment." The gown's 1,500 hand-cut butterflies and a six-foot cathedral train earned the raves of judges and the $10,000 first prize. "It kind of feels like I'm dreaming right now," Curletto told Reuters after her win. "Halfway through I was going to quit. I was crying and thinking, 'Well, I just can't do it. It's too much,' and a butterfly flew into my yard and landed on my hand." For three years in a row, Virginia florist Ronaldo Cruz has won the fan favorite entry. His off-the-shoulder lacy gown features intricate snowflake shapes and is modeled by his niece, Danika. Carol Touchstone's vintage creation includes 135 tassels, more than 6,500 strips of twisted toilet paper, and 6,000 beads. She used nearly three dozen rolls of two-ply toilet paper and two rolls of "vintage peach" Quilted Northern that she found online for the accompanying headpiece. Touchstone owns a vintage clothing store and has worked in fashion and interior design. Freelance designer Van Tran of Brooklyn was the winner of the 2016 design competition. For this year's contest, she made a form-fitting pantsuit with lace trim. “I’ve made a whole clothing collection out of used paper cloths, so this competition is a natural fit for me,” she told the New York Post. New Jersey artist Susan Masarek used white duct tape, glue and needle and thread to make her gown. It's sleek with a cape and pillbox hat, calling to mind Jackie Kennedy, circa 1963. It's the fifth year Mansarek has competed, each time as a top 10 finalist. "I don't think anybody is trying to say you should make your wedding dress out of toilet paper, but it's a nice way of saying I think we can bring that cost down in some ways," Masarek told NJ.com. "One message (that) is very important is not to go into debt for a big wedding and paying for it for years and years when you should have a wonderful, beautiful wedding and not going into debt to do it." Each year Ripley's (of "Believe it or Not" fame) displays a number of the finalist dresses. This year, the company will donate about 20 of the gowns to brides whose plans are in tatters due to the surprise bankruptcy of wedding dressmaker Alfred Angelo. But even if you don't have nuptials on the horizon, it's easy to appreciate the craftsmanship that went into these gowns. Here are more of the contest's awe-inspiring creations. Makes you want to head to your bathroom and see what you can do, doesn't it?